GET READY TO HAVE A BALL! Hamster Balls, Zorb Balls or Roller Balls as we call them is an experience of a lifetime. 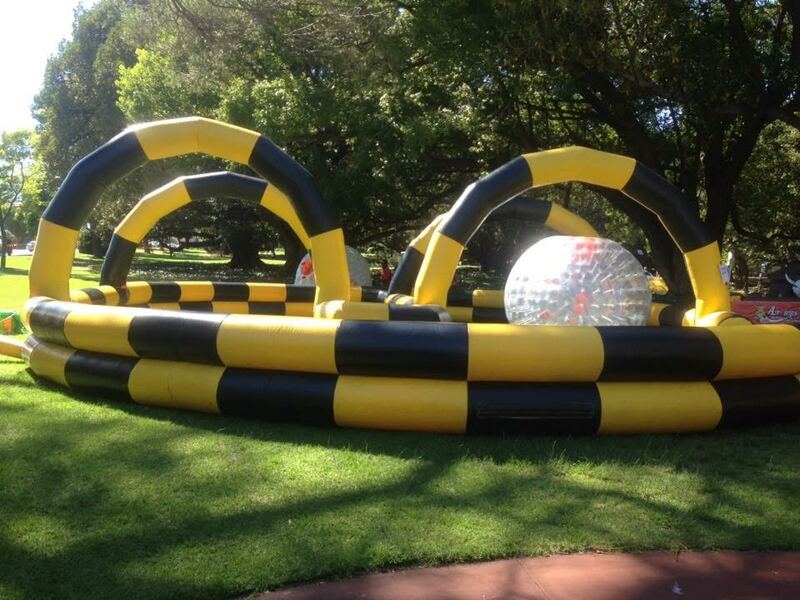 Our Roller balls hire is always a hit at any event. Get your guests really excited by hiring our Roller Track for an awesome visual effect! The art of the Roller Balls is you simply climb into the Roller Balls and start spinning. You can control how fast you roll, bounce, spin and bump or let our team do all the work by spinning you in a tumbling motion. Roller balls can be used on any flat grassed area. Our customised barrier/track will add an even more exciting adventure. Roller Barrier or Roller Track hire is $220 for a 3 hour hire with $55 for each additional hour. POWER: 1×10 amp power socket, within 25 m of unit, on its own circuit.